From left in the back row are NaNum Kim, Min San Seo, MiGyoung Kim, JiWon Kim, Sang June Park, HoJun Lee, EunWoo Jang, SeongHwa Jeong, ChanHee Lee, and YeongBin Lee. Members of Kyungdong Scholarship Foundation are sitting in the front row. From left are Auditor GuenMyung Hong, Director Ryung Heo, Chairman Mooyoung Jung, Director Jae Ho Song, and Director Soo Rae Jang. The 2016 Kyungdong Scholarship to provide full financial assistance to high-calibre students. UNIST celebrates the 2016 Kyungdong Scholarship Award Ceremony where a group of 10 freshmen were recognized for their academic excellence. The purpose of the ceremony is to officially present the award certificates to the successful candidates and at the same time pay tribute to their parents, teachers, as well as the board of directors supporting the annual scholarships selection effort. A certificate of recognition was awarded for receiving the Kyungdong Scholarship. 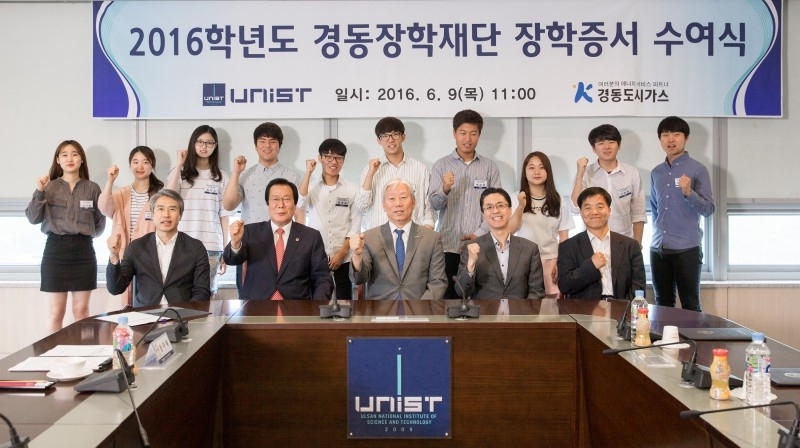 UNIST President Mooyoung Jung, was accompanied by President Jae Ho Song and Executive Committees of Kyungdong City Gas Co., Ltd., to present the awards. These individuals will be receiving the full tuition scholarship amount for up to four years, as well as annual financial aid funds to buy textbooks valued at about $700. “We are, and continue to be, impressed by the accomplishments of our students in being awarded prestigious scholarships, awards and research funding,” says President Jung. Established in 2007, Kyungdong Scholarship Foundation provided full financial assistance to high-calibre students, entering their first year of undergraduate studies. This scholarship is awarded on the basis of financial need, academic merit and involvement in extra-curricular activities (including, but not limited to music, leadership, community work).